Many people choose cremation when deciding on their funeral options, which requires them to also decide who will receive their ashes afterward, or where they will be interred if a location is chosen as their final resting place. This part of the funeral arrangements may cause some surviving family members to feel left out and excluded at worst. At best, others might experience a sense of increased loss when their family member passes away, simply because there is no physical location, unless a specific location is chosen, for them to visit as there is with those who choose a traditional burial plot. Having chosen a keepsake bracelet in advance will prevent this heightened sense of loss for surviving loved ones. Some people choose to have several purchased, especially in the case of large families. Many who have one of these bracelets often feel the loss of their family member with less severe pangs than those who do not have such a bracelet. While giving a awareness of the continuity of life through the circular shape, a bracelet also provides many wearers with a reminder of the deceased one that can be worn to increase a sense of closeness and bring back fond memories. The best quality ones are made of stainless steel, and can easily be engraved with a statement, or name and date. Some are simple bands, others have a special black finish that gives the bracelet a hematite appearance. Others have hearts on chains that are attached to a solid metal band. A few bracelets available are already engraved with a sentimental message, but have additional space for more personal engravings to be made. 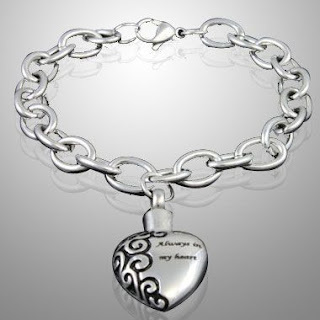 Stainless steel is the best choice for this style of bracelet for several reasons. Stainless steel is said to not rust, although in reality it can, but it is an easily cleaned metal that is not difficult to buff to a high polish again; it is extremely durable and not easily bent or warped, which is a common problem with gold band bracelets; and the natural sheen, or if a polished color is added, is a neutral color that goes well with any attire, including traditional funeral and mourning clothing. Stainless steel jewelry does not need to be removed when swimming, bathing or showering, or washing dishes. However, during any surgical operations, hospital policy is that all jewelry be removed, no matter the style nor type of material it is composed of.